The Gurupournima holds an unparalleled significance in the Indian culture. This festival is celebrated in every nook and corner, all across India on the occasion of the Ashadh Pournima (the full-moon day in the Hindu calendar month of Ashadh). This is also the day when Adiguru (the first guru) Shri Ved Vyas was born. Thus, this day is also known as the Vyaspournima. This festival is celebrated by recalling Sadguru’s unmerited grace and his unconditional love; by bowing down in reverence holding the sheer sentiment that ‘May the reign of the Sadguru remain in my life always!’ at heart and by performing the poojan of the Sadguru. How the tradition of this festival began in India, unfolds with a story. Maharshi (great sage) Vyas, who despite inscribing 18 Puranas and the Epic of Mahabharata, felt deep discontent and dissatisfaction. His mind was unsettled. At this time, sage Narada, the guru of Ved Vyas appeared before him in a vision and instructed him to compose a scripture with the praise of Lord Shree Krishna’s glory. Thus, Maharshi Vyas, with utmost reverence for his guru’s words, abided by it precisely and he received a unique experience of the sanctity of the ‘Guruvachan’(guru’s words). ‘It is only after one abides by his guru’s word does he experience peace, contentment and true satisfaction. Thus, the moral for us from this story of Maharshi Vyasa is “When I firmly resolve to act only as per his command, my life gradually achieves its purpose.” The story reveals how the tradition of celebrating the ‘Gurupournima’ in India was initiated in order to express gratefulness towards the great sage Ved Vyas. The Gurupournima Utsav is celebrated with great enthusiasm every year by Sadguru Shree Aniruddha Upasana Trust, Shree Aniruddha Upasana Foundation and associated organisations. Shraddhavans participate in the Utsav in large numbers. The first ever Utsav was celebrated with great fervour by the organisation in 1996. Thus, this festival is celebrated every year ever since. The event starts with the arrival of the Guru Padukas which in fact are the padukas of Sri Narasimha Saraswati from Sadguru Shri Aniruddha’s residence. Also, comes along Shree Guru Dattatreya’s idol from Shree Aniruddha’s place of worship at home. A Shodasha Poojan is duly performed offering Jalabhishek(anointment with sacred water) over the Shree Nrisinha Saraswati Padukas. Every Shraddhavan can take darshan of these Padukas. The Guru Geeta mentions the feet of the Sadguru to be entirely holy, and thus, the water from the Jalabhishek is distributed as Teerth. The mantra, ‘ॐ द्रां दत्तात्रेयाय नम:।’ (‘Om Dram Dattatreyay Namaha’) is continuously recited before the idol on this day. (‘Dram’ is Sriguru Dattatreya’s fundamental mantra. It has also been mentioned in the Datta Mala Mantra). 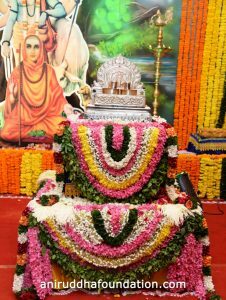 Apart from this, the poojan of Swayam Bhagwan Shree Trivikram, the original form of the “Sadguru” Tatva (principle) is performed. The Importance of Trivikram Poojan. In Tulsipatra 1464, Bapu also writes, ‘The basis of Sadguru tattva that is the Trivikram, keeps his Shraddhavans connected to him and rids his truest Shraddhavans of their perils in times of difficulties. A Shraddhavan will never be able to apprehend how Trivikram chooses to help him’. Also, while telling us the importance of worshipping Trivikram in the Agralekh no. 520 Bapu says, “Trivikram’s pooja, prayers or the devotional worship done in any form is an auspicious path which can surely rid a Shraddhavan of his insufficiency, poverty and weakness of any form or level. For Trivikram himself possesses excellent attributes (Saguna) and immensely full of the Nava-Ankur-Aishwarya. The Trivikram always grants his Shraddhavans in a fourfold measure the fruits of their faith and devotion. For his Shraddhavans, the Trivikram is the only support in this three-dimensional world encompassing all the three sides. Such is the Trivikram, for whom Shraddhavans receive the opportunity to perform pooja on the occasion of the Gurupournima. The Upasana of Trivikram isn’t just about reciting the prayers or the worship of the ‘Saakar’ (the embodiment of the divine form) or a divine idol, but it is the worship of the sacred or its ‘Mahadivya Saguna’ (the great divine virtues). 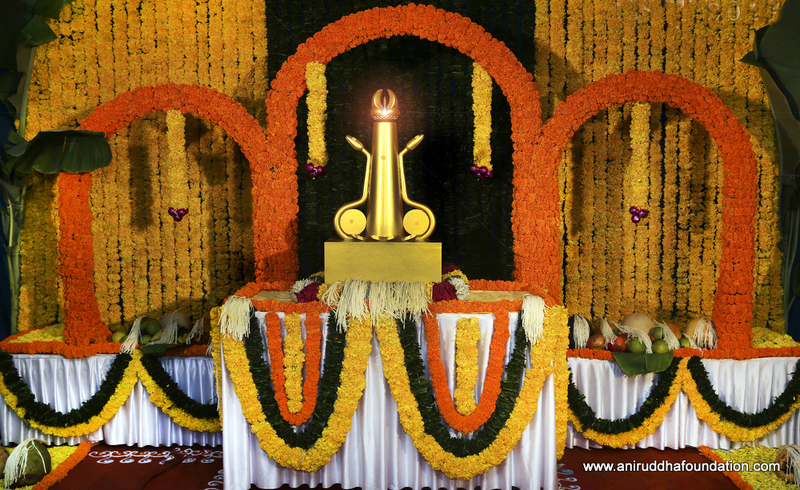 The Trivikram Linga (symbolic representation of the deity) is placed in a central position at the location of the Shree Trivikram Poojan at the festival venue, and every Shraddhavan performing the Poojan holds a tabak (salver made from the beetle leaf), which contains the three footsteps of the Trivikram. These three footsteps of the Trivikram are unconditional love, forgiveness and the acceptance of faith. It is with these footsteps that the Trivikram destroys the ill-fate and blossoms joy in a Shraddhavan’s life. The poojan of these three steps of the Trivikram is a prayer to him by all the Shraddhavans that ‘may his divine footsteps occupy their lives forever’. This is one of the important parts of the Gurupournima! The padukas of Sadguru Sri Aniruddha’s Nityaguru are placed on the Bhaktistambha (the pillar of bhakti), which is erected in the middle of the venue, and so are the two Avdhoot Kumbhas from the Avdhoot Chintan Utsav. Shraddhavans get the opportunity to carry the Ramnaam Ishtika, a brick made from the paper pulp of the Ramnam books and circumambulate around the BhaktiStambha to the rhythm of the gajar. They indeed experience and avail the auspicious vibrations there. ‘My Sadguru Mauli (mother) stands over this Ishtika (brick), symbolic of my faith over the Sadguru and I am carrying this Ishtika on my head and performing the Sadguru Pradakshina (circumambulation). This will cause my Sadguru’s feet to get etched in my heart forever. (कीजै नाथ हृदय महँ डेरा – Kijey Naath Hridaya Mah Dera). This is the sentiment of faith every Shraddhavan holds while performing the Pradakshina. Apart from this, a palanquin carrying Sadguru Shri Aniruddha Bapu’s feet impressions is moved around the Bhaktiganga which is nothing but a pool of all Shraddhavans. The Dindi that carries the palanquin, keeps making rounds all over the venue with a bustle of percussions while also chanting gajars. Every Shraddhavan gets the opportunity to place their forehead upon and take the darshan of Bapu’s feet impressions. Placing your forehead on these impressions is equivalent to placing it upon the Sadguru’s feet, is the sentiment in every Shraddhavan’s heart. Shraddhavans may offer the Uud in the Agnihotra (sacred fire), which continuously remains ignited all day long and pray for their welfare. 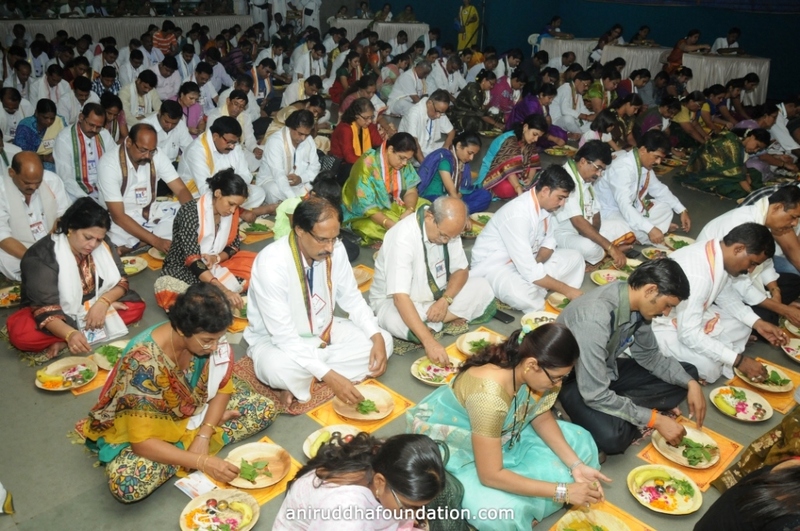 Shraddhavans may also seek the opportunity to attend the Shri Aniruddha Chalisa Pathan, which happens after every hour at the venue. 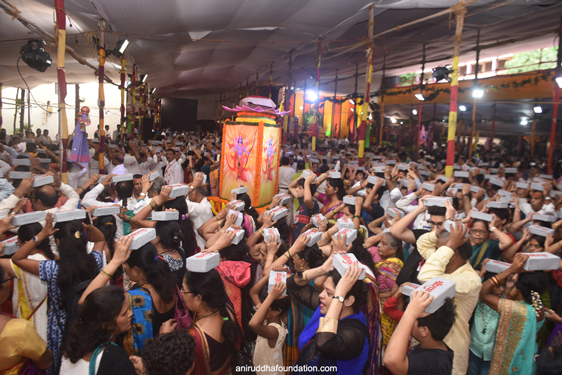 Even the Udi Prasadam, which has been touched by the hands of Sadguru Shri Aniruddha is distributed among the Shraddhavans. 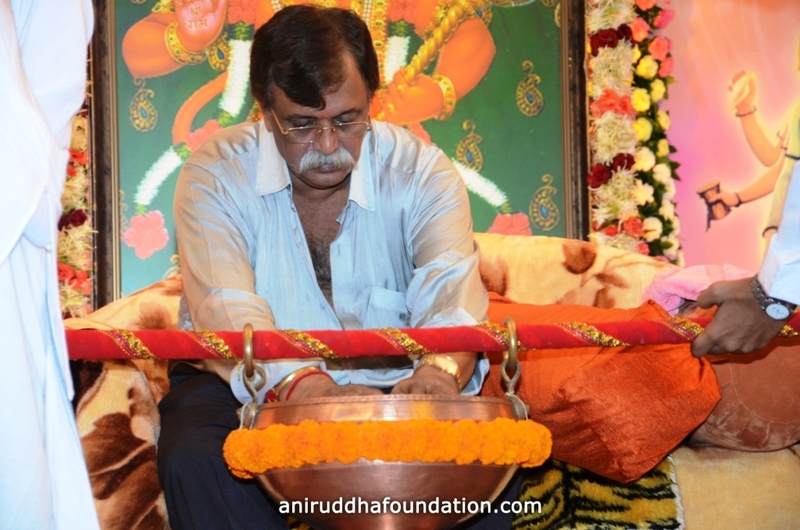 Shraddhavans may take darshan of Sadguru Shri Aniruddha until 9’o clock in the night which is followed by the Maha-Aarti. Sadguru Shri Aniruddha never accepts any kind of Gurudakshina, such as a gift, greeting cards, fruits, garlands, sweets, money or the like from anyone. Gurupournima is the day of getting immersed in the joy of the guru’s grace and in his devotion. It is the day on which one expresses one’s gratitude and unswerving faith towards one’s Sadguru. Thus, a Shraddhavan celebrates this Utsav in presence and company of Sadguru Shree Aniruddha, to express his gratitude with love. A Shraddhavan seeks the darshan of the Sadguru on this auspicious day with the sentiment, ‘अनिरुद्धा तुझा मी किती ऋणी झालो’ Aniruddha! Tujha Me Kiti Runi Zhaalo (Aniruddha! How indebted I am to you!) from the Aniruddha Rinadnyapak Stotra.